And then there was a place called Purgatory. It was where you went if you were too good for Hell, but not good enough for Heaven. At least, not yet good enough. Purgatory was, in effect, a series of waiting areas with gray walls and beige carpeting. Or maybe it was the other way around. The actual décor was never described to us in any detail, and we hadn’t been shown brochures or floor plans. Still, I had a way of filling in the gaps, whether they needed filling or not. According to my design, the rooms in Purgatory were small and drab, each with folding chairs arranged along the perimeter, and dim lamps and old fishing magazines with special subscription offers that were no longer in effect. Jigsaw puzzles depicting Bible stories and scenes of Heaven would be plentiful, but all would be missing important pieces. There would be a large clock with hands that hadn’t budged in decades, which would make everyone feel as though they were back in junior high school. Every surface would be coated with a thin layer of powdery dust. And a ceiling fan would turn slowly, not enough to circulate the stale air, but just enough to put the inhabitants into a deep trance. Not a lot happened in Purgatory, either. In truth, nothing happened. You would be periodically shuttled from room to room by strange beings who all looked like the Ghost of Christmas Future. There would be decent television reception, but they would have only one channel, and the President would always be on, interrupting their regular programming to deliver a speech about the nation’s worsening shortage of corrugated boxes. All in all, it was a surprisingly confined and uneventful space, given the number of people who would have been there. No one would ever be told anything helpful, and nearly every effort would prove to be wasted. It was somewhat similar to the Department of Motor Vehicles, minus the charm. 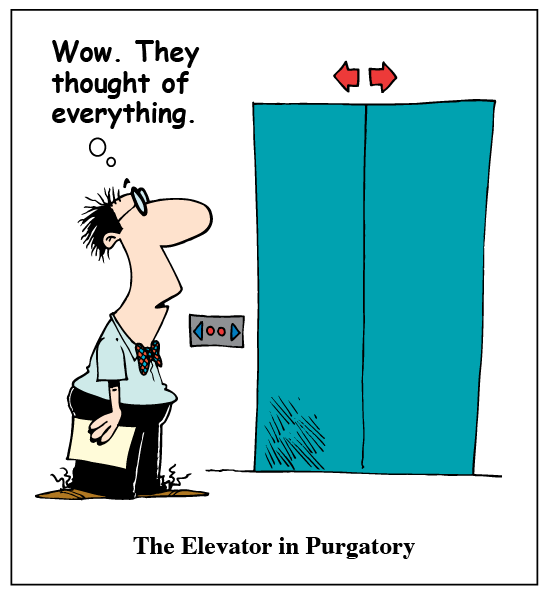 As a result of this low energy level, Purgatory would be eerily quiet, with strict rules against laughing or talking. However, it’s also possible that I harbored that impression simply because I first learned about Purgatory in Catholic school, which had strict rules against laughing or talking. Out of the three destinations, Purgatory got the least attention. It was the Canada of the afterlife. I’m not sure why, but I suspect the name had something to do with it. The very word Purgatory was unsettling. It sounded grim, like the kind of place where they’d make everyone line up in long rows, force us all to dress alike, and forbid us to go to the bathroom. Or was I confusing it with school again? On the other hand, Purgatory was the only one of the three that wasn’t permanent. I didn’t know if you had to leave. The thing to remember was that you could leave, which wasn’t true for either Heaven or Hell. And this was the key concept for most Catholics, because a spotless soul was difficult to maintain for any length of time. In order to move directly to Heaven after your life on Earth, you’d have to go to Confession, then die before you committed another sin. That was unlikely. 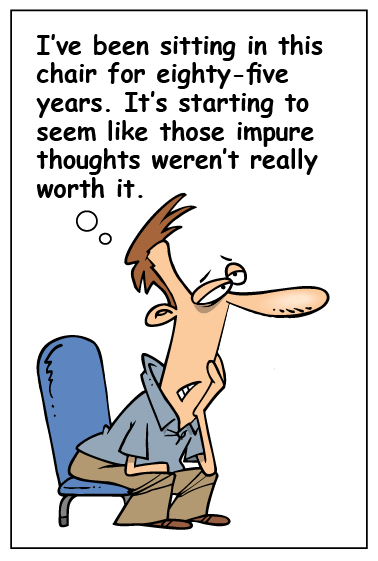 I usually went to Confession, then committed three or four new sins just on the walk home. A sin could be something as bad as burning down the barbershop, as harmless as saying out loud that you wished someone would burn down the barbershop, or as undetectable as thinking about how great it would be to go through the entire summer without a crew cut because some unnamed person had allegedly burned down the barbershop. See what I mean? You were almost definitely going to Purgatory. It was a terrifying sentence, but one that came with a spark of hope: the possibility of parole. Our teacher would sometimes come into the classroom and tell us that a close friend of her family had died and gone to Purgatory. She’d ask us to pray for this person, pray that God would call her up to Heaven to be with Him and the angels and saints. I was tempted to ask the teacher how she knew this person was in Purgatory, but I had a feeling the question would turn out to be more trouble than I needed just then. Besides, she was probably just trying to reinforce the doctrine in our pliable little brains. But if it were even partly true, that meant the afterlife was like an invisible board game that allowed you to make a lot of mistakes and still come out a winner. With the right spin of the wheel or roll of the dice, you could be back in the action. You could become good enough. And that seemed like something worth waiting for. You know, now that I think about it, the walls were more of an olive green, and the carpeting was brown with hints of orange. Or was that my house? This is a four-part post. Comments are off for Parts 2 and 3. Original artwork for the cartoons was done by Ron Leishman.